We are all aware that 40% of the country is currently under water. 9.5 Million people in 38 districts are flood affected. We feel that it is our social responsibility to stand beside the flood victims and the government at this time of national crisis. HCBL has therefore, allocated 50,000 US dollars for the cause and undertaken several projects. 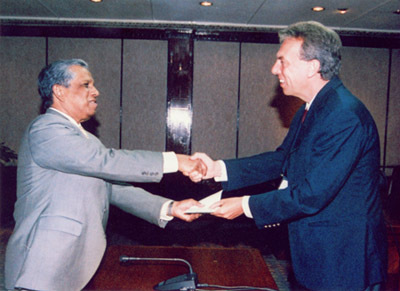 On 9 August 2007, our Managing Director, Mr. Jean-Claude Jamar handed over a cheque of Tk. 1 million to the Honourable Chief Advisor, Mr. Fakhruddin Ahmed at the CA's Office.